A variety of social causes —women empowerment, child development, rural development and education – will be served by the donation drive. 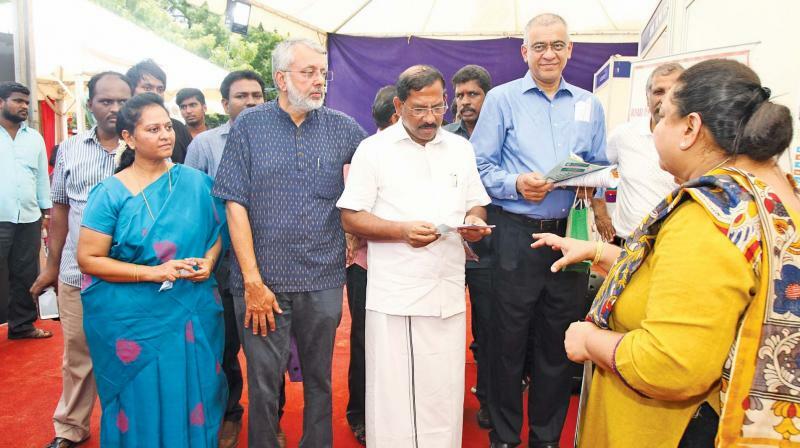 About 100 NGOs from different parts of Tamil Nadu have been brought together on the same a charity fair and carnival exhibition platform of Seva Mela. This is part of the Daan Utsaav week in its 8th year in Chennai. The two-day fest is on at the Lady Andal school grounds. A variety of social causes —women empowerment, child development, rural development and education – will be served by the donation drive. The objective is to build a bridge between society and the various social causes through a series of fun and interactive sessions. Post the inaugural, a skit was organised by ‘Puthir Vannam’ in collaboration with Seva Mela, gathering children through a social media campaign. Different non-profit foundations displayed their handicrafts and the proceeds would be utilised to carry out the wishes of children at risk. Thousands of wishes by children are stuck on a ‘Wish Tree’ waiting for people to open them and see if they can fulfil the sweet wishes of the kids. The ‘Battle of the Buffet’ is also provisioned by the popular ‘Food Trucks for Charity’ as part of Daan Utsav 2018 and Seva Mela 2018, a ticketed eatery system to raise funds for many initiatives. ‘Child Voice’ from Dindigul, which works on adolescent girls’ education and vocational guidance designed interesting games and displayed earnings for sale, said Sibija. ‘Christ Faith Home for children’, which works for single mothers, runaway cases and destitute children displayed their crafted handbags for ladies, by ladies, shared Christy, a social worker from the home. ‘Udhavum Ullangal’ serves cancer patients. The ‘Cross Blood Foundation’, working on blood cancer patients, has some homemade cookies on display. Creative exposure was given to the children. “The idea started seven years back with 25 NGOs, but today more than 100 NGOs put up stalls. A lot of good work happens thanks to them and the idea was to showcase all that in the ‘joy of giving’ week called Daan Utsav. The NGOs had pitch for putting up stalls. If their project is chosen, we give them money” shares CIOSA’s managing trustee Latha Rajan on the utsav, while talking on the idea behind the project. The initiative of Seva Mela is by three organisations – CIOSA, United Way of Chennai and Chennai Mission – and it aims to bring together social workers, corporates and volunteers under one roof to create greater awareness.